When are two pawns enough for the piece? The funniest thing that came out of the whole Luis Suarez biting incident at the World Cup was the news that a Norwegian fan won close to $1000 on a 'prop' bet that Suarez would bite someone during the tournament. I'm a little surprised that there was even a market for this, but if Indian cricket bookmakers have shown us, there is probably a market for any and every aspect of a sporting contest. But as usual, chess has historically led the way. Back in the 19th century one form of wager was on which piece would, or must, deliver checkmate. To make it a real contest, this was usually a knight (the 'capped knight') as stronger pieces could easily accomplish the task. The challenge was initially to keep such a piece safe, before using it to finish the job. 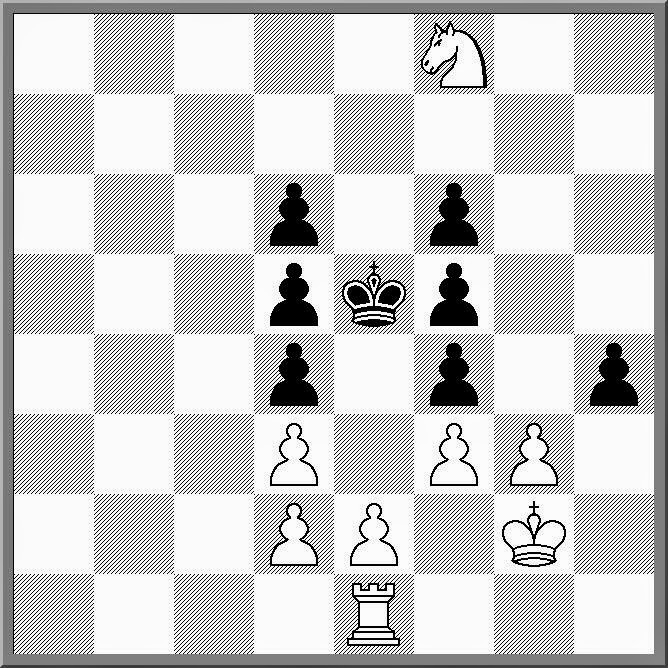 A classic example of this is the following game between Lange and Schierstedt. Lange's Queens Knight was the required piece, and he managed to win a game which would have been brilliant without the requirement. I can only assume he was far stronger than his opponent though, as after move 2, the strategy of throwing everything at the knight seemed obvious. this problem pre-dates the Jun v Larsen game by a number of decades. It is White to play and mate in 4 moves. Like most good problems, the side variations are as interesting as the main line. I've previously mentioned the Vacuum Tube chess set, and I think the Nuts and Bolts set as well. To add to this collection is the "Sewing Set". Not only is it sewn together (the board is cloth patchwork), the pieces are made out of sewing gear as well. There are spools, bobbins and scissors, all put together to make up the pieces. While it may not be the most practical set in the world, it is one of the more creative efforts I have seen. If you wish to check it out, or even have a go at making one yourself, the description of the set, along with plenty of pictures, is here. I spent yesterday revisiting some of earliest organisational memories, as the Chief Arbiter of one of Canberra's inter-school events. While inter-school chess in Canberra is probably as old as Canberra itself, the current format of single day team events started in the early 1990's. While I was involved in a laot of the early events (which were often held as part of the ANU Chess Festival), I was happy to let others take the reins after a few years. However I normally put my hand up for one or two events each year, and this year saw me running one of the high school zones. As with these types of events, the standard of play was mixed, although generally higher than 20 years ago. I suspect this is because more kids play chess at an earlier age, and even if they aren't 'active' players in High School, they still remember enough to keep by. Interestingly enough, it was a number of 'active' players on the junior chess scene who didn't play this year, for reasons I suspect have a lot to do with feeling it was all a bit beneath them. Knowing how to mate with R v K is an even better skill. One player even received a round of applause from spectators when he eventually worked it out! Beware: The 4 move check mate still works. There was one player (with a decent junior rating) who wasn't paying attention and walked straight into it. While a draw by insufficient material, or repetition, or even agreement, is not the same as stalemate, don't waste your breath explaining the difference. 'We had a stalemate' even when it wasn't, was a common phrase. In cricket there is a term ' the corridor of uncertainty. It is the line just outside off stump when a well directed ball will have a batsmen in two minds about whether the let the ball go, or try and play a defensive shot. The perfect delivery is one that will either hit the stumps if the ball is left, or takes an edge if the player tries to defend. The only reason I mention this is to show the following game. I originally saw it in "Improve your Chess in 7 days" by IM Gary Lane, and the finish was particularly striking. In fact the whole game is well played by White (22.Nb1! ), but when the Black king to f6, 31,g4 leaves it trapped in the 'corridor of certain mate'. A very late blog post this evening, due to technical issues. Spent a good part of the evening trying to get my new broadband connection to work, including nearly an hour on the phone to a polite tech support guy. While it turned out he was not able to help me in exactly the way I needed, he at least provided company while I eventually worked out the solution myself. Of course sometimes chess is a bit like that as well. On certain days you feel that your role in the game is simply to provide your opponent with the chance to find all the good moves. Click on the link below for the weirdest start to a chess game I have seen in a long while (NB I did not personally witness the infamous Telfer v Grcic game in the early 90's which *began* with the pieces being swept off the board). It comes what I assume is a real children's program in Russia. Two kids are about to start a game when they realise a black rook is missing. Rather than find a replacement, or substitute a pencil sharpener, one of the kids (who looks about 10 years old) builds a lathe out of stuff lying around the house, and then makes a rook out of the left over wood! He even paints and dries it, reading for use in the game against his by now bored opponent. You can see the whole thing here. Thanks to Andrew Wilkinson for finding this for me, and if any Russian speakers are reading this blog, further information about this clip would be appreciated! One of my favourite news feeds is cracked.com. I normally read it just before I fall asleep, much to the annoyance of my wife, who is often woken up by my giggling or outright laughing. But the reason why I am mentioning this now, is that one of their new articles is "17 Board Games to awesome to exist". Some of the games include "Army Men" - with Magnifying Glass (for those sunny days), and "Ignorance Must Be Punished" which has a taser as part of the equipment. Feel free to read through the article, although I suspect it is NSFW, but make sure you get all the way to the end. The always energetic North Sydney Chess Club is soon hosting another important event, the 2014 Oceania Seniors Championship. This is open to all players who are 50 years or older at the end of this year (ie If you were born in or before 1964 yo can play). Since its establishment, this event has grown in popularity, and this year is no exception. With FIDE lowering the definition of senior to 50 years not only have the number of potential entrants increased, but they have also become stronger. Top seed for this years tournament is currently IM Gary Lane, with FM Bob Smith second seed. The tournament runs over 4 days from the 3rd to the 6th of July (7 rounds), and entries are still open. If you are interested in playing in the event (or as a youngster, just wish to spectate) then all the details can be found at the tournament website. While there were some still willing to bet against him there was a sense of inevitability when Magnus Carlsen added both the Rapid Chess and Blitz Chess World Champion titles to his current collection. He finished a full point ahead of Ian Nepomniachtchi and Hikaru Nakamura, in the just finished event in Dubai. His result drew the expected praise from his contemporaries and prompted GM Ian Rogers to ask him if he was going to go after the Bullet Chess and Correspondence World Championship titles (the answer was no to both). Carlsen's holding of all three titles is in a sense a first, although it had been far more difficult in previous years as the Blitz and Rapid Championships weren't always held. Some people have also pointed out that Susan Polgar held all 3 Women's titles in 1996, having won the Rapid and Blitz in 1992, and the Women's World Championship in 1996. One effect of this victory is that both the Blitz and Rapid World Championship titles will become more significant, at least over the next few years. Hopefully the very strong field that took part this year will be repeated for future editions, with players either trying to repeat Carlsen's effort, or simply trying to stop him from doing it again! A very quick win by Mamedyarov over Judith Polgar in the current World Blitz Championship. He set it up with the sneaky Kb1, which should always be a warning bell if you play Qa5 in such positions. Sergey Karyakin thought it was funny enough to tweet about it, but then got bitten by karma 2 rounds later when he lost to Polgar! An interesting attempt to foster international co-operation took place in Switzerland yesterday. A team of Swiss parliamentarians took on team of Russian parliamentarians in a friendly, but competitive match. While it might be safe to assume the Russians would have a natural advantage in playing strength, their team was boosted by the former World Champion Anatoly Karpov, who is a current member of the Russian Duma. While it was supposed to help relations between the two countries, not everyone was happy, and there were complaints about a 'friendly' match with Russia, given the situation in The Ukraine. A full report of the match is here, although who actually won the match was not stated. In an interesting foreshadowing of the 2014 World Championship Match, Viswanathan Anand has beaten Magnus Carlsen in the 12 round of the World Rapidplay Championship. Aand outplayed Carlsen in an ending where he had a rook against two pieces (normally good for the two pieces), using is outside passed pawn as a potent weapon. Carlsen looked to be aiming for a drawn RvN ending after giving up his other piece, but Anand was able to restrict Carlsen's knight and force a winning position. There is the often made claim that if we were alerted to 'critical positions' once or twice during a game, we would perform 100 or 150 rating points better. This is often used as a possible example of 'smart' cheating, where a player need not be told the best move, simply that they should be looking for one. However if this were demonstrably true, players would have been using this technique for decades. I'm not talking about using computers or a signalling system, but simply by watching the body language of spectators. Plenty of times I've seen a spectator come up to game, spot a strong move, and then rush off to tell other spectators. I would have thought that this might provide a conscious, or sub conscious clue, but I've yet to find a player who exploits this. The diagram position provides an example of where this may have been helpful. 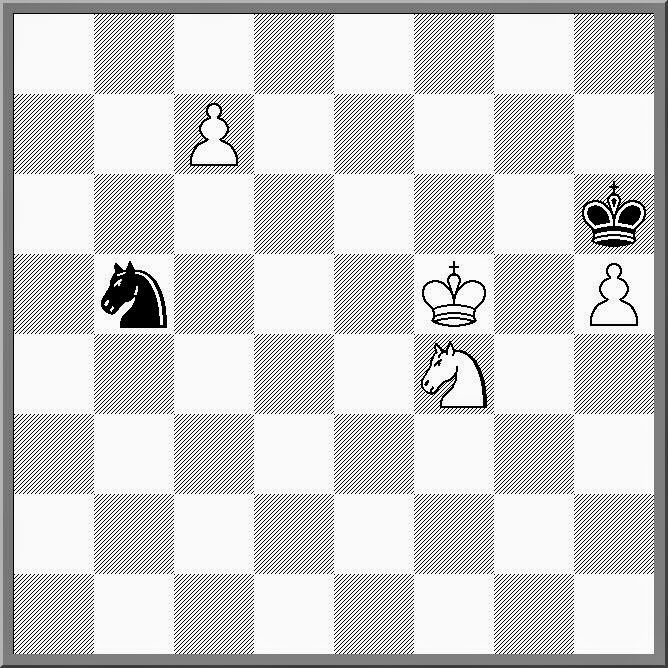 It is White to play, but he realises that 1. c8=Q walks into 1. .. Nd6+ Instead he chose 1.Kg4, surrendering the pawn and half a point. Clearly this was a position where chattering spectators might have helped as White had a far stronger idea. I leave it up to you to find it. Clearly the UAE is the place for chess at the moment, with the worlds top players in Dubai for the World Rapid and Blitz Championship. But after that is finished the Al-Ain is hosting the 2014 Asian Championships League. It is an event for the top chess clubs in Asia, although this requirement has been relaxed for countries like Australia, who do not have a national club league. As a result Australia is sending a composite team, nominally representing Western Sydney, The team is a reasonably strong one (IM Illingworth, IM Lane, Zelesco, IM Sandler, FM L. Jones), but is still seeded 7th out of the 8th teams. And while the top two teams are all GM affairs, the teams ranked 4th-8th are actually pretty closely bunched. The tournament starts on the 20th June. There is further information on the tournament web page, including the fact that the Chief Arbiter for the tournament is FA Brian Jones. Sergey Karjakin has made it back to back wins in the Norway Supertournament, repeating his victory from last year. After a fairly sluggish start (by all players really), Karjakin finished with 3 straight wins, to keep half a point ahead of home town hero Magnus Carlsen. While Carlsen also won his last round game, it was his round 8 draw with Peter Svidler that sabotaged his tournament. In an almost winning position Carlsen missed the chance to share the lead with Karjakin by failing to spot the right continuation. In third place was Alexander Grischuk, who provided a lot of the tournaments early excitement with 2 wins and 2 losses in the first 4 rounds, before picking up the important final round point. Apart from Karjakin, the player who picked up the most rating points was bottom seed Simen Agdestein. At one point it looked as though he might finish the event with 9 draws, but losses to Topalov and Carlsen in the final rounds left him at the bottom of the table. But as he was rated significantly lower than the rest of the field, 3.5/9 resulted in a rating boost for him. With this event finished, some of the players are off to the World Blitz and Rapid Championships in Dubai. This event has attracted a very strong field, and the action starts tomorrow. The tournament website is here, with the first 6 rounds of the Rapid starting proceedings. I've come to the conclusion you can play f5 early against any opening, and hilarity will ensure. In most cases it is also a novelty, or near novelty, and while it is often totally unsound, at fast time control games (G15m or less) it will give you a lead on the clock. There are of course some sound uses (Schliemann, Dutch and possibly the Latvian) and some complete shockers (The Tumbleweed). Today I played a line that feel someway in between, helped no doubt by my opponents way of meeting it. I don't have the complete game, and as he took the wrong piece on move 16, it is probably not worth showing. But even if he retreated his queen to b1, I had a clear advantage in the position. Of course there are other changes as well, so if you an arbiter or player, then I suggest you visit rules.fide.com and refresh your knowledge before you start your next event. The FIFA World Cup starts early tomorrow morning Australian time, and I assume that there will be no other sports coverage for the next month. As the father of a football mad teenager I guess I will have no choice but to get into it, especially as he will probably be waking the house at 2am most mornings to catch the early game. While the scheduling of the World Cup once again provides the Australian sports fan with the usual time zone challenges, we at least get the last game of each day at a reasonable time. On almost all days there are 3 games, at 2am, 5am and 8am Eastern Australian Time. An early wake up will get some of the middle game, while the late game can be watched at home/work. And if you are in Canberra on Saturdays, once the final game is finished, come on down to Street Chess (from 11am), to catch the replays at King O'Malleys's while playing a bit of rapidplay! FIDE have announced they have accepted a bid to host the 2014 World Championship Match in Sochi, Russia. Sochi was of course the venue for the 2014 Winter Olympics, so I assume they will have plenty of venues to host the event (in the same way that Turin held the 2006 Olympiad). The FIDE announcement stated that the budget for the match is $3,000,000, although how much of that will be prize money is not stated. There had been rumours of a possible last minute bid from Norway, but this seems not have materialised. The other interesting issue from this bid concerns the upcoming FIDE elections. If Kasparov manages to unseat Ilyumzhinov, will the FIDE President be able to travel to the city hosting the FIDE World Championship Match? Or the Ruy-d Liver. This was the opening I ended playing in a recent local club event. Despite it starting as a normal Ruy, my opponent pushed my bishop onto the a2-g8 diagonal before castling and then let me play Ng5 with his bishop on f8. With a couple of extra tempo up my sleeve Nxd5 cried out for the sac on f7, and the game ended with a typical king hunt. Normally you see a piece sacrificed for three pawns (for two pawns it is normally a blunder), but I suspect opinions differ on the correctness. I've seen conflicting advice on whether it is better to have the extra pawns in the ending, middlegame or opening, and I guess there is no hard and fast rule. More likely it is a case of 'annotation by result' where successful sacrifices are correct and unsuccessful ones are 'brave' at best. But in the case of the current game it seems it is neither winning or losing, merely 'exact'. While I was visiting the FIDE Office in Athens, I had the opportunity to pick up some older issues of the FIDE Trainers Manuals. They had plenty to spare, although sadly this was due to them being returned to the office by National Federations who either did not collect them, or more commonly, failed to maintain a valid postal address. While flicking through them I saw and interesting article by Georg Mohr called "Learning from the Old Masters". In part it was a tribute to Milan Vidmar Sr, and also a description of the first Budapest Gambit played in an important game. Interestingly it was a friend of Vidmar's, Abonyi, who suggested he play it against Rubinstein, but this suggestion came only half an hour before the game was due to start. The players also did not have a chess board to hand, so Abonyi had to describe the opening to Vidmar. But as you can see, Vidmar picked up enough information from Abonyi's description to score a spectacular win over Rubinstein. Having travelled all the way to Greece, it is fair to give in an update on the meetings I have been sitting in. The Rules and Tournament Regulations Commission has discussed a number of matters, but for some reason has been hung up on tie-break definitions. This is a rather abstruse topic, especially when mathematics becomes involved, and took quite a while to sort out. Having dealt with that (although not completely), we had a much more discussion about Disabled Chess. The outcome of this is that tournament organisers need to be more proactive in encouraging the participation of disabled players in events. Anti-cheating got a run, and we had a good discussion of the proposed Anti-Cheating Regulations. Not everything in the paper found favour with the RTRC members (including myself), and there will be suggested changes. A further refinement to the proposed Competition Rules (formerly Tournament Regulations) is currently underway, but I suspect that time may be against us. Most importantly, if you have managed to read this far, you should realise that such meetings are not beer and skittles, and in fact do the work that no one else would be willing to do! While Blitz games are a mixed bag at best they are (like boxing) at least fun to watch. The Norway tournament had a blitz event at the start, and this resulted in at least one talked about game (Carlsen v Caruana 1-0). However I did spot a couple of other interesting games including the following one. Agdestein went the pawn hack against Svidler but ended up in a position that reminds me of a Nimzowitsch game (I forget which one). Then Agdestein looked for salvation with the exchange of queens but instead had his king dragged up to board, and into mate! The 2014 ANU Chess Festival is once again taking place in late July and early August. As in previous years the Festival will consist of the ANU Open and Minor, a teams blitz event, and ANU Schools Championships. Of course the major events will be the ANU Open, which always attracts a strong field. The Open will be held on the weekend of the 26th & 27th of July, at the ANU School of Art, Childers St, Australian National University. There are $3,300 in prizes and entry fees are $65 for adults and $40 for juniors. If you wish to find out more details about the Open, as well as details of the other events, follow this link. The website will also allow you the register for the event online, but please download the brochure for payment information. The second Norway Super GM (after 2013) begins today. Interestingly the major sponsor is a Malta based Online Gaming Company (Unibet), but due to Norwegian legislation, they could not put their logo on any of the publicity material. So the event is known as "No Logo Norway Chess", although telling this story probaly helps the generate at least some publicity. While the tournament starts today. yesterday saw a blitz event to determine seeding numbers. Top seed Magnus Carlsen finished on top with 7.5/9 (+6=3) ahead of second seed Lev Aronian. In the first round of the main tournament Carlsen is white against Giri, while Aronian has white against Agdestein. In terms of who is to win, is is pretty easy to tip Carlsen, although he only came second last year, to Sergey Karjakin. I'd like to see Aronian do well, while Karjakin and Caruana are the players 'most likely' if Carlsen slips. The official tournament website is here, and you can follow all the action online. How to catch a chess cheater is the front page article on the latest issue of Chess Life (the USCF's magazine). It is a feature on Professor Ken Regan, both an IM and the worlds leading authority on computer cheating in chess. Normally such a feature would only be available to paid subscribers, but the editorial team thinks the issue is of such importance that they have made it publicly viewable. Just a quick travel update. I arrived in Athens this afternoon, after a fairly unmemorable flight from Canberra via Sydney and Abu Dhabi. (It is like catching a very crowded bus for me these days). I'm spending a couple of days as a guest of FIDE Executive Director Nigel Freeman, before moving on to the Rules Commision meeting. I've discovered that I am surrounded by ancient history where I am located, as the Acropolis overlooks the apartment. Across the road are the remains of Hadrian's Library, while even the local metro station has it's own archeological site. Tomorrow will be a mixture of site seeing the ancient ruins, plus a visit to the FIDE Office to see how things work, up close. But for now it is the usual travelers lament of being tired at the wrong times of the day, and trying not to make up at 3am local time.